Matt maintains a broad civil litigation practice, focusing on medical malpractice, municipal liability, and general insurance defense. He defends hospitals, private medical companies, and individual physicians and dental professionals against claims of malpractice. His municipal liability practice includes defending law enforcement officers and cities against claims of excessive force and other claimed constitutional violations. His insurance defense practice includes personal motor vehicle claims, construction claims, and premises liability claims. 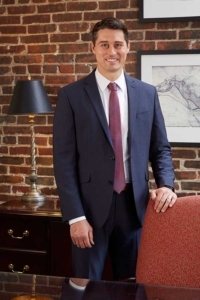 Matt joined Phillips Parker Orberson & Arnett, PLC, in October 2009, after obtaining his Juris Doctor degree from the Louis D. Brandeis School of Law at the University of Louisville. While in law school, he was a published member of the University of Louisville Law Review, competed in the Saul Lefkowitz Moot Court Competition, and was a member of the distinguished Brandeis Inn of Court. Matt was born and raised in Waukesha, Wisconsin. He attended Marquette University for his undergraduate education and received a Bachelor of Arts in Political Science. While at Marquette, Matt was a four-year letter winner on the varsity track and field team. As a senior he was elected Captain, captured the Big East Conference championship in the decathlon, and competed in the NCAA National Championship meet. Matt was also awarded the Cura Personalis Award in 2006 for his commitment to excellence in academics, athletics, and leadership through service to others. He is admitted to practice in the Commonwealth of Kentucky and United States District Court, Eastern and Western Districts of Kentucky. He is a member of the Kentucky and Louisville Bar Associations, American Bar Association, the Kentucky Defense Counsel, and the Defense Research Institute (DRI). In his free time, Matt enjoys spending time with his wife and chasing his two young children around the yard. He also enjoys running, playing basketball, softball, volleyball, throwing the javelin, and supporting the Milwaukee Brewers, Milwaukee Bucks, and, especially, his Green Bay Packers.